Persistence Market Research offers an eight-year forecast for the global tempeh market between 2018 and 2026. The report also includes macroeconomic indicators along with an outlook on tempeh for the global market. The study demonstrates in-depth analysis of the key market dynamics, which are expected to influence the market performance in the long run. The report also comprises the study of current issues with consumers and opportunities for tempeh products. The report also offers updates on recent trends, key drivers and restraints, volume and value forecasts, and various opportunities for manufacturers operating in the global and regional tempeh markets. Increasing demand for meat alternatives across various regions has resulted due to a spate of illnesses related to improper handling and processing of meat, as well as the reduction in the consumption of red meats owing to a growing focus on leading healthy lifestyles. Tempeh is being increasingly used as a meat-substitute in burgers and sandwiches and other junk foods. Being savory, tasteful and healthy, it allows consumers to indulge while also allowing them to follow their health regimes. Another key factor expected to drive the adoption of tempeh and other meat substitutes is the rising awareness and sensitivity towards animal cruelty, due to which the market for tempeh is expected to expand at a robust growth rate of 6.1% between 2018 and 2026. In order to provide users of this report with a comprehensive view of the market, we have included detailed competition analysis of the key market players and strategic overview. The dashboard provides a detailed comparison of tempeh manufacturers on parameters such as total revenue, product offerings, and key strategy. The study encompasses market attractiveness analysis by source, nature, flavor, product type, distribution channel, and region. The report includes tempeh market company profiles and the revenue generated from the companies across North America, Latin America, Europe, Asia Pacific and the Middle East & Africa. By source, the global tempeh market is segmented as soybean, multi-grain, and others. Tempeh produced from soybean is the predominant segment and is expected to account for over 92% of the overall market in terms of revenue. By product type, the market is segmented as frozen, fresh and ready-to-eat. Furthermore, by nature, the global tempeh market is segmented organic and conventional. By flavor, the market is segmented as plain and herbs & spices. By distribution channel, the market is segmented as direct and indirect. For the calculation of revenue collection of average regional prices were obtained through primary quotes from numerous tempeh manufacturers, retailers, and distributors. All key end users have been considered and potential applications have been estimated on the basis of secondary sources and feedback from primary respondents. Country demand patterns have been considered while estimating the market for various end users of tempeh in the different regions. Top-down approach has been used to estimate the tempeh market by countries. Global market numbers by source have been derived using the bottom-up approach, which is cumulative of each country’s demand. The market has been forecast based on constant currency rates. A number of primary and secondary sources were consulted during the course of the study. Secondary sources include Factiva, and Hoover’s, and company annual reports and publications. The report provides detailed competitive and company profiles of key participants operating in the global market. Some of the major companies operating in the global tempeh market are Turtle Island Foods, Inc., Nutrisoy Pty Ltd, Mighty Bean Tempeh Sunshine Coast, Totally Tempeh, Byron Bay Tempeh, Margaret River Tempeh, Organic Village Food, Gwen Tempeh, Tempeh Temple, Primasoy, SBC Tempeh Manufacturers, Lalibela Farm Tempeh, Alive & Healing Inc., Henry’s Tempeh, Rhapsody Natural Foods, TOFU Manufaktur Nagel GmbH, Impulse Tempeh, Schouten Europe B.V., Natural Oriental Fresh Foods BV and Tempea Natural Foods Ltd.
Also, another key feature of this report is the analysis of all key segments in terms of absolute dollar. This is traditionally overlooked while forecasting the market. However, absolute dollar opportunity is critical in assessing the level of opportunity that a provider can look to achieve, as well as to identify potential resources from a sales and delivery perspective in the global tempeh market. Various diseases associated with meat have impacted the dietary and culinary preferences of population towards consuming meat products, especially those containing red meat. On the contrary, the demand for meat substitutes such as tempeh is increasing at a steady pace for the past few years. Tempeh is a soy-based fermented product which offers various health benefits and fills the diet gaps by providing essential elements that nourish human body. Intake of meat substitutes including tempeh, tofu, seitan, etc. is largely observed among population who prefer a vegan diet as these products contain high amount of protein and calcium. To cater to this increasing demand, manufacturers are focusing on investing in research and development to expand their product portfolio by launching different types of meat substitutes with various flavors catering to different taste preferences. According to the report by Persistence Market Research, the global meat substitutes market is projected to expand at a CAGR of 6.1% during the period of forecast, 2018-2026. Key market players are focusing on entering new markets by means of collaborations and partnerships with a view to reinforce their product lines. Few of the key players profiled in this research study include Turtle Island Foods, Inc., Nutrisoy Pty Ltd, Mighty Bean Tempeh Sunshine Coast, Totally Tempeh, Byron Bay Tempeh, Margaret River Tempeh, Organic Village Food, Gwen Tempeh, Tempeh Temple, Primasoy, SBC Tempeh Manufacturers, Lalibela Farm Tempeh, Alive & Healing Inc., Henry’s Tempeh, Rhapsody Natural Foods, TOFU Manufaktur Nagel GmbH, Impulse Tempeh, Schouten Europe B.V., Natural Oriental Fresh Foods BV and Tempea Natural Foods Ltd. The concept of frozen food is growing at a steady pace, with awareness regarding various advantages of frozen food triggering their consumption on a large scale. In addition, nutritional value provided by frozen food is relatively higher than fresh food, as freezing of food items prevents the loss of essential proteins and vitamins during their transport or storage. Frozen tempeh is gaining significant traction in the global tempeh market, although fresh tempeh is still expected to hold a lion’s share of the market. 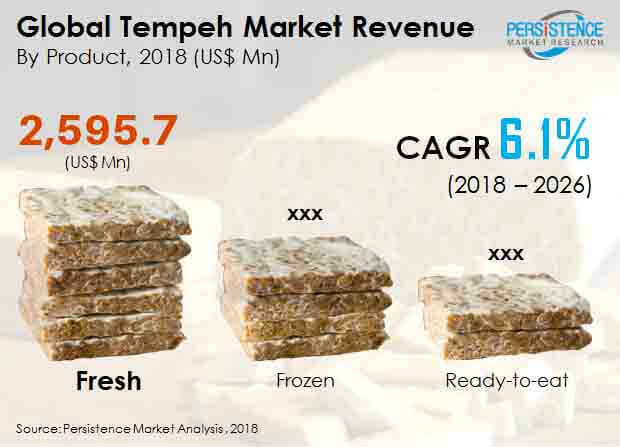 Frozen tempeh is expected to witness revenue generation of over US$ 1.4 Bn by the end of the period of assessment with a high demand in the coming years. Manufacturers of tempeh are continuously striving to enhance their presence across the globe. Foodservice providers have a proven record of higher sales of meat substitutes such as tempeh across various countries and are a highly lucrative end use segment. In addition, with the emergence of E-commerce, online stores are gaining high traction with respect to any food produce. Online stores are another potential selling platform for tempeh and is projected to gain traction in the years to follow. Meat substitutes are high in proteins, typically soy proteins. Soy proteins is a highly preferred protein source owing to advantages such as fat loss, carb regulation and healthy diet. The soy segment is poised to generate sales of about US$ 5.5 Bn by 2026 end owing to established production methods, taste preferences of consumers and incorporation in a variety of recipes. Also, the global market for tempeh is also influenced by the increasing demand for mycoproteins are they are free of cholesterol and help in maintaining normal cholesterol levels. They are a rich lean protein source and highly preferred among the younger generation. Considering that tempeh is native to Indonesia, the production and sales of tempeh in Indonesia and other ASEAN countries is expected to remain steady as compared to other regions in the globe. Majority of the population in ASEAN countries have been consuming tempeh for hundreds of years. The tempeh consumption in North America is expected to account for a significant increase, registering a robust CAGR of 7.0% over the assessment period.